The campus recruiter is in charge of building a pipeline of talented up and coming candidates. The job spans many departments, walks the line between online and offline recruiting, as well as being driven by key seasonal booms (mostly commonly occurring during late spring and early fall) as students transition into the next phase of their budding careers. I had the chance to catch up with Cassie Stover, University Relations Specialist at Delphix, a Data as a Service company bringing enterprise data into the modern age. It’s a 400+ person company based in Menlo Park, and she was kind enough to share insights into what drives successful campus recruiting programs. If you could ask one question to a candidate, what would it be? Cassie: That’s a tough one… I guess it would come down to, “Tell me about your favorite technical challenge.” We want candidates who are looking for hard things to do. People who like working on problem probably have no simple answer, and maybe even have several answers. We want people who live for the challenge. To us, innovation is fostering a culture of curiosity. What makes a successful campus recruiting event? Cassie: We have a lot of success recruiting from universities where our employees get to go back to their alma mater. For example, when we return to campus recruiting events at Brown with Delphix Brown alumni, we always drive a lot of interest and generally hire a strong cohort of top students. As we expand the number of campus recruiting events we attend, and enter new regions where we have little brand recognition or alumni presence, the success of the event is as much about growing out long-term talent pipeline as it is about making a hire today. Who should become campus recruiters? Cassie: Recruiting is all about relationships. Before this role, I wasn’t a formally recruiter, but I’ve always been a networker with a procedural mind. A lot of the credit definitely goes to my manager, I spent a lot of time shadowing her. I learned it comes down to trying to meet as many people as possible, and as a recruiter striving to be a few steps ahead, you need to constantly be considering questions such as, ‘What can i do for them? What’s next contact point? How can I create a good opportunity for this person?’ And for campus recruiting specifically, you definitely have to be ready for the busy season. From August to Mid-November, I’m either on the phone or going to campus 24/7. It takes a lot of energy to do - it’s a challenging job!. What are the greatest challenges facing campus recruiting? And how do you solve them? Cassie: We are part recruiter, part program coordinator, and part event planner. There’s always the challenge of not enough hours in the day. We have a cross departmental standing meeting every Friday, and in the busy season that often moves to an email checkin. You have to prioritize. Also, the landscape has become really competitive - there are more opportunities than there are top talent to fill them. We’re constantly addressing how we can create a unique candidate experience, and set ourselves apart from other companies. How to get the most out of your employees at job fairs? Cassie: We’re thoughtful about preparing our reps for campus in the fall, giving them the confidence to talk about the product and company in their own words. Sales professionals and engineers will talk about Delphix differently, so we need everyone aligned on our messaging to be consistent across all students that we meet. 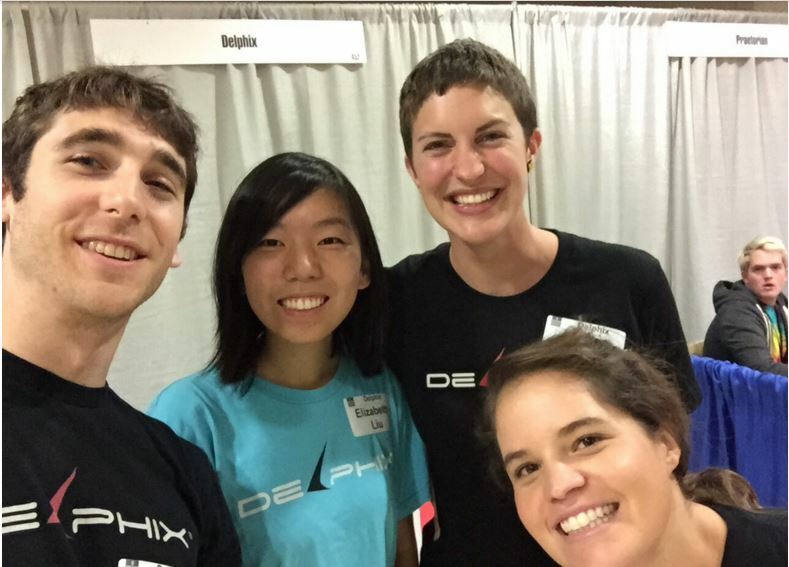 We also leverage the knowledge and contacts of our campus reps that are returning to their alma mater, and encourage them to be the face of Delphix for their peers. Our reps love to go to campus because they know it’s a chance to pick who they work with, and a great opportunity to make their teams and our company even better. Rakuna is the campus recruiting solution.